When contemplating putting a permanent wave or curl in their hair many individuals have trouble deciding between an at-home treatment and professional services. While the professional perm or body wave can be more expensive there are many advantages to making an appointment at a salon. Perhaps the most important advantage to obtaining a professional perm at a salon is the knowledge that the process will be correct, and therefore safe, for your hair. Professional stylists always analyse a customer's hair before applying any chemicals. After determining the health, texture, and type of hair, stylists can recommend certain solutions or processes that won't cause further damage or lead to breakage and hair loss. Other advantages to professional perms include choice of style and curl selection. Home perm kits usually only offer a small selection of curler size, chemical strength, and resulting style. With a professional perm you can choose how tight or loose your curls will be and how much chemical will really be necessary to provide long-lasting curl. Plus, the stylist will be more familiar with different rolling techniques so you can choose how your curls will lay and how they will work with your current hairstyle. Finally, only a professional stylist can quickly fix anything that goes wrong with the perming or waving process. What Type of Application Should You Ask For? Once you have decided to go for a professional perm you need to decide which type of application to ask for. The perm application you want will depend on the type of curl you are hoping for. A body wave or body perm will give hair volume, loose waves, and very little curl. A regular perm will give hair tight curls that offer bounce and movement. A root perm is applied only at the roots of the hair strands and is used to provide lift and volume to thin or heavy hair. And, a spiral perm will result in long, corkscrew type curls that create a more romantic, thicker look in long hair. When choosing a perm type it is best to keep your hair texture, length, and style in mind. You also need to take your face shape into account. A professional stylist can help you choose the curly look that will be best for you. Aside from understanding how much curl you need or want, you also need to choose the chemicals used based on the needs of your hair. Some perm solutions are milder on hair and result in less permanent damage. Other solutions, especially those needed for coarse, thick, long, or hard to perm hair contain stronger chemicals. The three most common perm solutions include acid, alkaline, and exothermic. Acid perms are generally mild and are perfect for colour-treated, damaged, fine, or fragile hair. 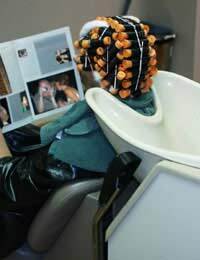 These perm solutions usually produce more flexible curls and are often used in body waves and loose perms. Alkaline perm solutions provide a stronger holding curl and are perfect for coarse or hard to perm hair. Since the chemical reaction is stronger these types of perms can be damaging to the hair shaft if not used properly. Finally, an exothermic perm is a great choice for almost every hair type. This solution uses heat from chemical reactions to help the product enter the hair shaft and mould the hair into a curler shape. The resulting wave or curl is very bouncy and long lasting. No matter what type of perm you want or hair type you have, the safest, most effective way to get the curl you desire is through a visit to a professional salon. @Rose. You'd need to ask a medical professional or a trichologist about this. Do you think a perm will take on someone who is on kidney dialysis?I'm not sure how long she's been doing the dialysis.She has fine hair and thinning; I know acid perms work best for this type of hair.